www.photomacrography.net :: View topic - Green Bee? Posted: Sat Dec 23, 2017 2:15 am Post subject: Green Bee? Pentax K3, with a 28 - 80 zoom with a macro "function", and a 28mm extension tube in bright sunlight. This has reminded me that a) the wind never stops blowing, b) I need to buy a monopod, and c) I really need to work on my core muscle strength. For some reason forum "BBCodes" were disabled for you which is why the picture didn't show. I've enabled them. I've never seen a sleeping bee, and as far as I can remember the pictures of them mostly come from Australia. Cool things, must be nice to find. It's obviously quite a deep subject to get a lot in focus. One way people go to help control the wind and relative movement, is to hold the twig in a hand which has a stiff connection to the subject, so both move together. What working distance do you get with your lens+ tubes? I never go out for my macro expeditions without my white umbrella.. The bee isnot green .. it's your white balance who is jammed ... looks to be a Collete sp. or polyester bee. ChrisR - Thanks for fixing my issue with the image, I'm still learning the nuances of the forum! I don't believe the bee was sleeping, just taking a rest. With this setup I have about 10 cm (4 inches) between the last piece of glass and the subject, with the full rig on the camera the last piece of glass is about 18 cm from the focal plane of the sensor. Unfortunately to get that close I had to lean over a metre high stone retaining wall! Yawns - thanks for the tip, I'll bear that in mind. I don't believe my white balance is in error as the bee is definitely green, I saw it again this morning in fact. A quick google search on the names you mentioned would appear to indicate that it could be a cellophane or polyester bee, which are solitary tunnel dwellers. Unfortunately they are not native to this part of the world, so it's on it's holiday I'm not sure what it is. I'll dig around and see if I can find out more. Edited to add: Checking with another couple of sources the opinion is that this is a Blue banded bee (Amegilla cingulata). Nice photograph Andy. We have them here too in North Carolina, rather small of course. 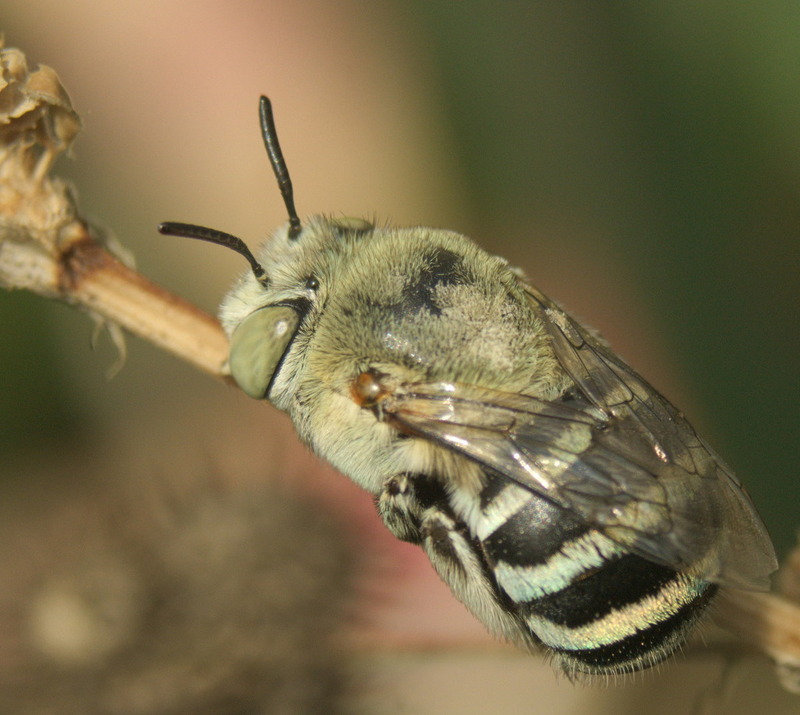 I often find them hanging by their mouthparts right before a summer storm or at dusk and the only reference that I have had of them is that they are Kleptoparasitic bees or Cockoo bees.